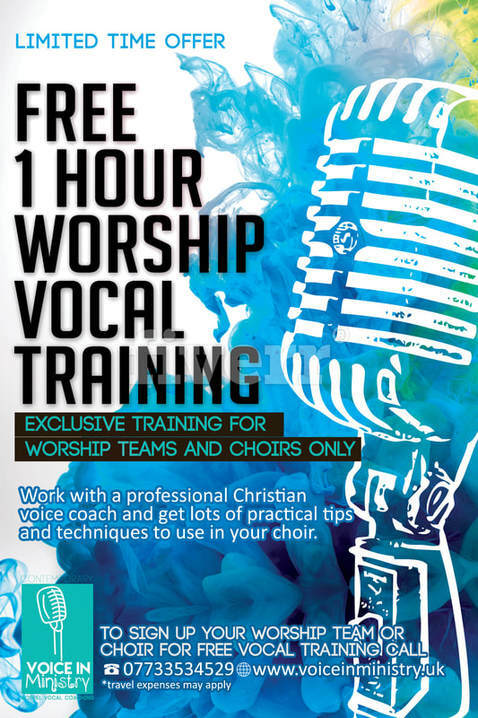 Looking for training, advice and vocal inspiration for your worship team or choir? If you're looking for fresh ideas and professional coaching to develop your singers then VIM would love to share our knowledge and passion with you and your team. A free workshop takes place during your own rehearsal time so no need to book an extra day where you are painstakingly trying to organise everyone for the same day and time. No need to worry about childcare or arranging for the PA and musicians either. VIM simply comes to you and takes part in your rehearsal time. Normally, rehearsals take about 2 hrs giving plenty of time for training to take place. Book online,below, to arrange a time for VIM to attend. understand what we do and why we do it. Get insight into your team's vocal strength's and weaknesses. Tips and advice on using techniques that work quickly to help overcome poor vocals skills. Effective warm up techniques for Sunday mornings. Live demonstration of vocal technique. Work with a professional coach. Build your team's members confidence to sing. Ideas to prepare for your worship conference or event.